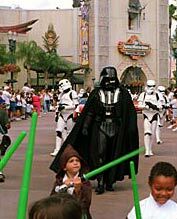 "Share a Dream Come True" Parade, an all new day time parade, begins in the MAGIC KINGDOM on October 1, 2001, as part of the Walt Disney World 100 Years of Magic Celebration. 100 years of the imagination and dreams of Walt Disney are happily celebrated by Mickey Mouse and 100 Disney Characters in an eye-popping spectacular parade of magical, musical, life-sized "snow globes." 100 Years of Magic Celebration Coming October 1! Aladdin Scheduled To Open This Month... Marketplace Now Open! Disney’s “Aladdin,” one of the most beloved and popular motion pictures of all time, inspires this colorful attraction, at the Magic Kingdom. Adventureland makes a fitting home for The Magic Carpets of Aladdin, filled with the wonder of genies, flying carpets, magic lamps and Middle East mystique. This is the first permanent attraction with Aladdin theming at Walt Disney World Resort. Adjacent merchandise area of Agrabah Bazaar and Zanzibar Trading Co which is now open. Timekeeper Space To Become Character Meet & Greet? Latest Goings On @ Walt Disney World!